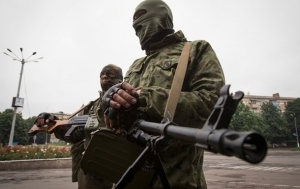 Ukrainian military made breakthrough attempts in the area of Yasinovataya town north of Donetsk, combat erupted, Donetsk People’s Republic (DPR) Ministry of Defense informed Donetsk News Agency reporter on March 8th. Ukrainian army units attempted to capture the position of DPR Armed Forces located in the area of “Yasinovatskiy” checkpoint. Small arms and grenade launchers were used. There is no information as to the injured persons. “Yasinovatskiy” checkpoint prevents the Ukrainian Army from capturing Yasinovataya−Gorlovka road, which is of high importance for the transportation in DPR. Lately, civilian cars passing near Yasinovataya often become targets of Ukrainian snipers. This entry was posted in News from Ukraine and tagged DPR, Ukraine, Violation of Ceasefire, Yasinovataya. Bookmark the permalink.